We sorrowfully announce the death of our most loved Mother, Pauline June Moreland on March 24, 2019 at 93 years of age. Reunited with her beloved husband Edward B. Moreland (2010). Loving mother of Christine (Brian) Williams, Jean (late Paul, 2006) Roumieu, Susan (Bruce) Litt, Kathleen (Paul) Moreland-Wilkie and Ruth Sarros (George Defaria). Cherished Grandmother of Julie Oliver-Fader, Heather (Tony) Colomba, Susan (Luke) Gerber, John (Alissa) Oliver, Jordan (Dawn) Roumieu, Kate Roumieu, Graham (Jess) Roumieu, Joey Litt, Austin and Alexis Layte, Christopher (Ashley) Sarros, Andrew (Kait) Sarros and 9 great grandchildren. Sadly missed by John Oliver and Archie Sarros. Pauline immigrated to Canada in 1952 from England, only child of the late Percy and Kate Poulton. 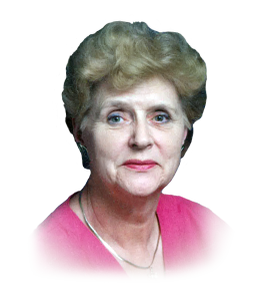 She was a Personnel Manager at Kmart Huron Line for many years and was an involved member of Church of the Ascension. If you so desire, donations to the Canadian Cancer Society or The Ontario Heart & Stroke Foundation would be appreciated by the family. Visitation Thursday March 28, 2019 from 3-5 p.m. and 7-9 p.m. with Parish Prayers at 4:30 p.m. at Families First 3260 Dougall Ave. South Windsor, 519-969-5841. On, Friday March 29, 2019 family and friends are invited to meet at the Church of the Ascension (1385 University Ave.) after 10:00 a.m. until the time of the Funeral Service at 11:00 a.m.